Heart Blood Vessels, Sem iphone x case by Steve Gschmeissner. Protect your iPhone X with an impact-resistant, slim-profile, hard-shell case. The image is printed directly onto the case and wrapped around the edges for a beautiful presentation. Simply snap the case onto your iPhone X for instant protection and direct access to all of the phone's features! 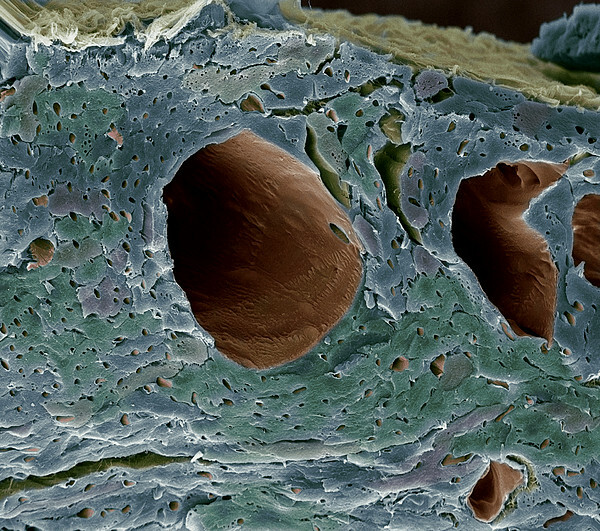 There are no comments for Heart Blood Vessels, Sem. Click here to post the first comment. Heart blood vessels. 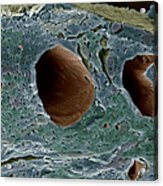 Coloured scanning electron micrograph (SEM) of a freeze-fractured section through cardiac muscle, exposing the blood vessels of the heart. 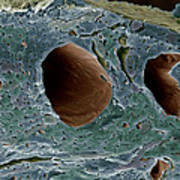 Large blood vessels are seen lined with endothelium (the single-celled layer coating the inside of blood vessels, brown). The smaller blood vessels (capillaries, small holes) supply blood to all parts of the heart. The blood vessels have been emptied of blood. Cardiac (heart) muscle continually contracts (under subconscious control) to pump blood round the body. As such, it requires a rich supply of oxygenated blood, explaining the vascularity (presence of many blood vessels) of this tissue. Magnification x300 at 6x7cm size.